The All Blacks keep winning, but are the results papering over cracks? (AAP Image/Paul Miller). In times gone past the Wallabies had celebrated hard men that left no quarter in the battle. Who will forget Wallabies like Steve Finnane, Tony Shaw, Sam Scott-Young – to name but a few. These hard men set the tone for the match and imposed themselves in such a way that ensured the Wallabies received front-foot-ball, maximising the opportunities for the backs. 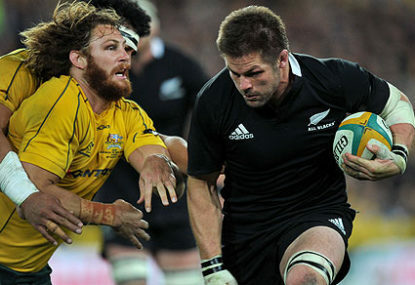 Much comment has been made about the expected brutal contest between the Wallabies and the Lions. The tacit implication is that the most brutal team will win. So how will this translate to the current crop of Wallabies? Especially since the game has now been sanitised with the banning of rucking and referees now enforcing yellow or red cards for punches thrown while having the aid of the TMO to further analyse “rough” play. How dirty can play get? No doubt the likes of James Horwill, Rob Simmons and Kane Douglas will fire up to impose themselves on the game. It will be interesting to see if noted hard man Hugh McMeniman, who is coming back from injury, makes the cut. No doubt Robbie Deans is sweating on the abrasive Scott Higginbotham to be fit – even if chances are slim. As always it will come down to Wallaby front row – Saia Fainga’a plays a similar brutal game as Tatafu Polota-Nau and should be the starting No 2. Robinson and Slipper both need to fire up to meet the challenge coming their way. Tough and aggressive Paddy Ryan should be on the bench ready to launch himself into fire. It’s about invoking the spirit of the Australian diggers – meeting them head on and not giving an inch.